Welcome to the new home of the M9 bayonet. 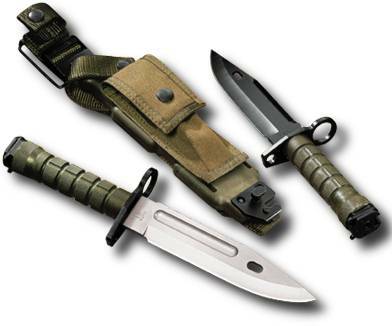 On this website you will find the most complete history and description of the M9 Bayonet that you will find anywhere. The history starts with the development of the M9 Bayonet by Qual-A-Tec which later formed the company Phrobis III. Phrobis III was formed to interacted with Buck to make the first M9 Bayonets. Buck manufactured M9 bayonets with both Phrobis M9 Bayonet and Buck M9 Bayonet markings for several years. Over time, Buck managed to get control over the supply of the M9 Bayonet in the United States until Lan-Cay underbid Buck in a key military contract. Lastly, in the 1990s the US Military offered for bid a new contract that was split between Lan-Cay and Ontario Knife Works. These facts and many more are included throughout this website. The information here has been compiled from numerous "experts" and noted collectors who have aided with the development of the content of this website. This is being shared here as the M9 Bayonet is one of the post popular AR15 parts and accessories sold and available as a military surplus item but yet bayonet identification and M9 bayonet history is often confused. We hope that this website is already the ultimate M9 Bayonet resource on the web and that the tools are here to allow everybody to share their photos, questions, and knowledge. Please browse the pages on the site and visit The Forums. We welcome all visitors to join and share their knowledge of the M9 Bayonet so that this site will continue to grow.